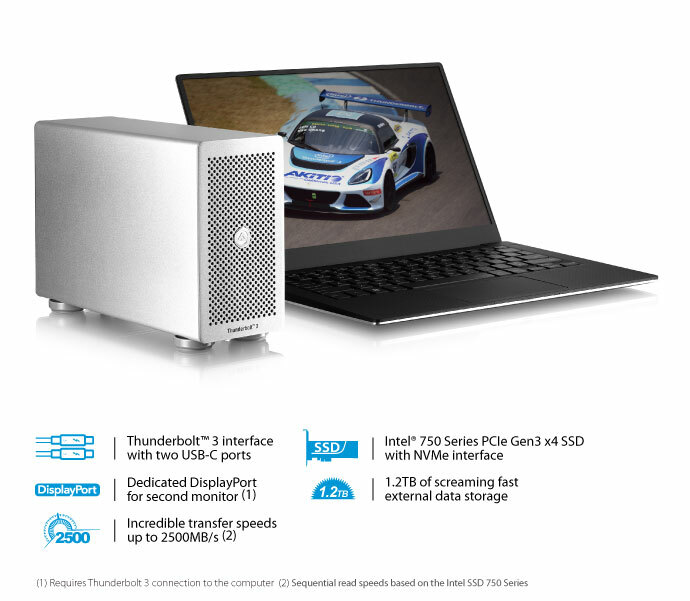 A screaming fast external storage solution for your Thunderbolt™ 3 computer. The Intel SSD 750 Series is Intel's first PCIe Gen3 x4 SSD developed for the client enthusiast and workstation markets. In combination with the lightning fast Thunderbolt™ 3 interface, the AKiTiO Thunder3 PCIe SSD is able to deliver over 2000 MB/s of read speeds. No longer limited to large RAID systems, professionals in need of speed can now take the drive with them on location and work on footage in the field. 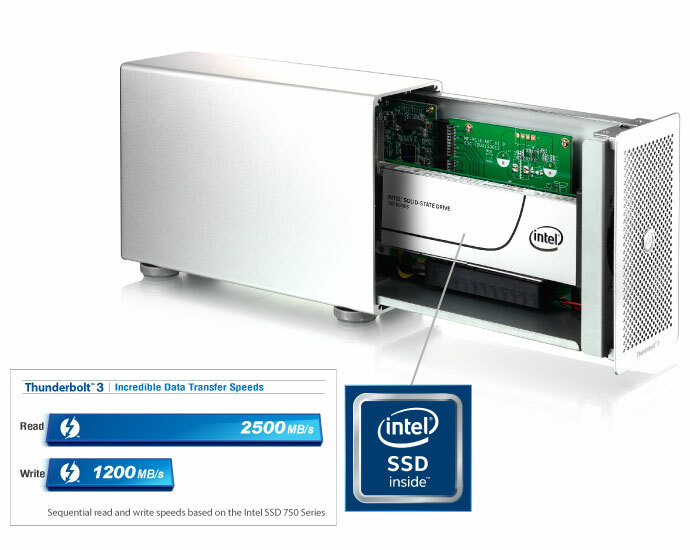 The Intel SSD 750 Series is Intel's first PCIe Gen3 x4 SSD developed for the client enthusiast and workstation markets. The Intel SSD 750 Series was designed with the new Non-Volatile Memory Express (NVMe) performance controller interface that delivers outstanding performance, low latency, and superior quality of service. The AKiTiO Thunder3 PCIe SSD has two Thunderbolt 3 ports. The second port operates the same as a Thunderbolt 3 computer port by supporting Thunderbolt 3 (up to 5 daisy-chained), USB 3.1 (10 Gbps), and DisplayPort devices. 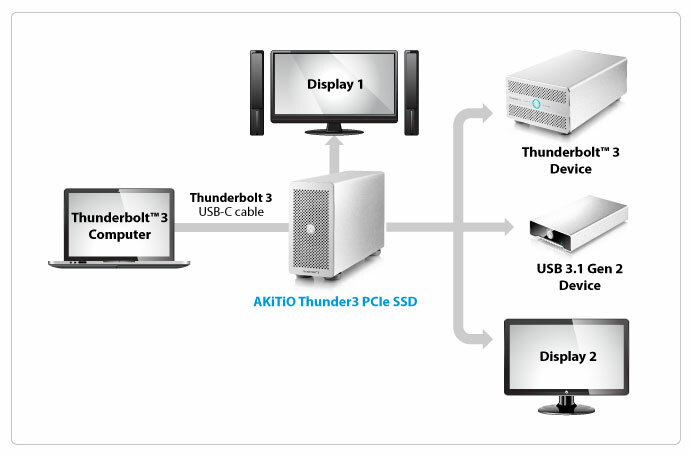 The AKiTiO Thunder3 PCIe SSD provides users the ability to edit and playback multiple streams of HD and/or 4K content with enough headroom to simultaneously daisy-chain additional displays and storage devices. 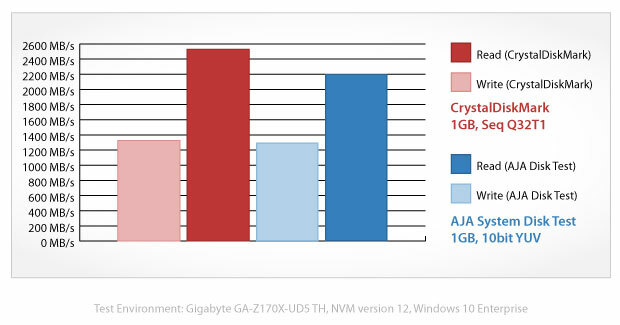 The transfer speeds for this benchmark were obtained using the AJA System Test tool and CrystalDiskMark for comparison. The results from the AJA System Test closely reflect the real-world performance but the actual transfer rates can vary depending on the test environment.